A compressor’s function is to increase the pressure of a given quantity of gas. This is achieved by a process which reduces the gas volume, thus increasing its density, whilst leaving the state of the gas unchanged – the gas does not become liquefied. Compressing gas also means the temperature of the gas is raised due to the increase in gas pressure. Compressors achieve increased gas pressure by various means, though they all utilise fuel to drive the actual compression phase of the process. In a reciprocating compressor, pistons are used to achieve compression and the design of this compressor-type mimics the piston-driven features of an internal combustion engine. A central crankshaft drives between two and six pistons, each located within its own cylinder. Normally, power is supplied to the crankshaft via an external motor of an electric, petrol or diesel type. 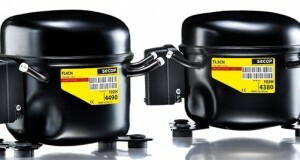 The power rating of this motor sets the horsepower specification of the reciprocating compressor. On the piston ‘up’ stroke, gas is sucked or drawn into the piston cylinder space from the compressor intake valve. On the ‘down’ stroke of the piston, the gas is rapidly compressed by reducing its volume. Next, the compressed gas is discharged either for use directly from the compressor to drive a pneumatic device, or for collection and storage in compressed-air tanks. One of these options must be employed to prevent pressure losses. In industry, compressors are required for gas compression in the processing, storage and transport of chemicals; for instrument air systems; and for air compression facilities. Such compressors fall into one or other of two general classifications: either continuous flow, or positive displacement. Reciprocating compressors are described as positive displacement types with an intermittent flow and their function is often a critical phase of the industrial process they facilitate. These machines can employ a range of drive configurations, lubrication methods and cooling processes; and offer either single or multi-phase compression according to the particular demands of each industrial operation. Various reciprocating compressor design patterns have been devised, from basic single-cylinder types up to complex multi-cylinder, multi-phase variants. In a single-action cylinder there is just one sector each for suction, compression and final discharge. Double-action models allocate two sectors for each part of the same suction, compression and discharge cycle, whilst larger reciprocating compressors can utilise an array of four or six cylinders.